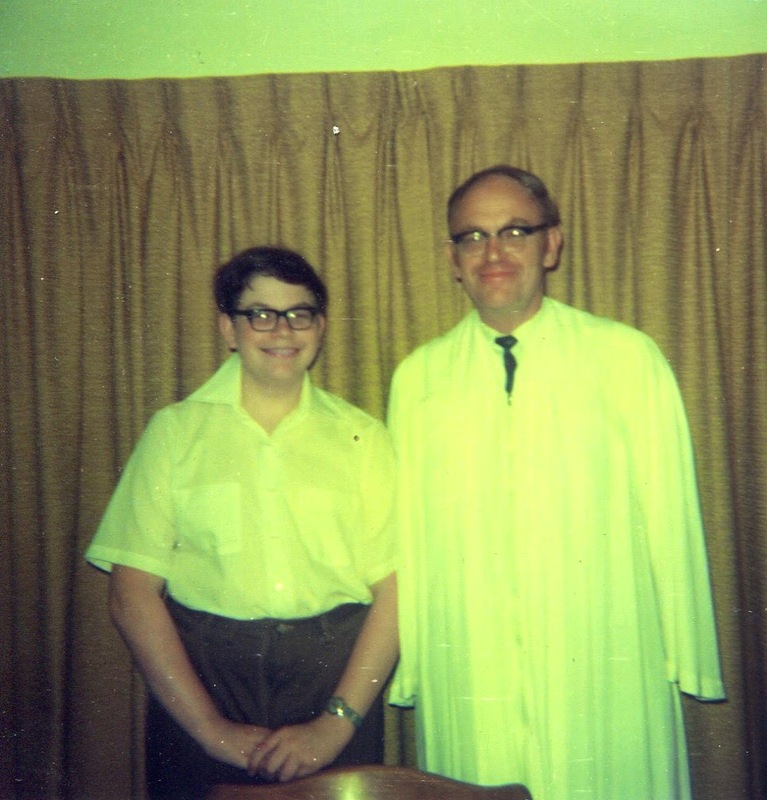 August, 1975: the day I was baptized, and the distance began to grow. This one's going to be rough. Dad's service was four days ago, and it was a great celebration for those who attended. It went on for two hours, with music, memories, video, images, and much more. Those who missed it missed out. Sadly, there were many who missed it: the church was, at best, half full, mostly family, plus the Lake Oswego United Methodist choir. This despite emails, Facebook posts, an obituary in the local paper, death notices from the conference, and possibly a few other means of announcing the event that have slipped my mind. The church that baptized my father and licensed both him and his father to preach, and of which his mother was unofficial matriarch for half her life, provided maybe a half dozen people. There were more out-of-town Methodists than Baptists in attendance. Mostly, this service was for Andersons. I realize that it's hard to stir up interest in a man who has been mostly absent from community events for eight years, who rarely attended the church hosting the event even when he was healthy, and who, especially in his last few years, was increasingly confined to his home. Dad was never a pastor in McMinnville. He retired there from churches so far removed by time and space that those who still remember him were probably too old and infirm to make the trip. So that's the good reasons for lack of attendance. There's one other, though, that is more challenging to admit: my father was not popular. In fact, at times he was, as the popular description of founding father John Adams puts it, obnoxious and disliked. He was a man of integrity, and such persons are rarely well-liked. Being true to his principles came before currying favor with church dignitaries, and so he never climbed the ecclesial ladder to larger churches and the superintendency. Most of his appointments--including his last--paid minimum salary. He never complained about this, and was always diligent in the performance of his pastoral duties, visiting every person in his small congregations, including those who vehemently disagreed with his progressive opinions about social issues, theology, and science. At times these visits probably devolved into tense debates, especially around the topics of evolution, gun control, and communism. Some of the small strokes he began experiencing in 1979 may have been triggered by the stress these debates induced in him. Growing up, I sensed the strain his work placed on him. He rarely talked about it, but there were times when he seemed far too tightly wound for his own good. As a young child, I was oblivious to these things, but once I entered junior high, I began hearing just how disrespected he was by my classmates and their parents; and I'm sure some of the bullying I experienced was at least partly a result of people knowing whose son I was. (It was also junior high, and I was a total nerd, so I can't put it all down to that.) Moving to Oregon freed me from that oppression, but it did not lighten my father's struggle to be true to his principles while pastoring people who disagreed with them. I know it took a toll. We moved every three years, a frequency that is high even for Methodist ministers. We would have moved after three years in Philomath, too, except that my father pleaded with the Bishop to remain there an extra year so I could graduate with my high school class. This is where it gets difficult for me: during those years in Philomath, even as my father was fighting for me, I, being a teenager, was craving distance from him. Part of it was that, in many ways, my father just didn't fit in with other parents. When he dressed casually, he looked shabby, unkempt, preferring clothing that was well past its "best by" date. He was older than the other kids' parents, well into his 50s by the time I was a senior. And, of course, he was the Methodist minister. Everything about him stuck out, and when I was around him in a place where other teenagers might be--say, a Scout meeting--I found his presence excruciating. I surreptitiously rolled my eyes, wishing he could be somewhere, anywhere else than this event where I wanted to be respected by my peers, rather than embarrassed by my father. He didn't deserve this, of course. Throughout my childhood, my father was never anything but a loving, attentive parent, doing his best to teach me the skills he thought I needed to become an adult. But that's true of many parents, and it doesn't keep any of their know-it-all teen-aged children from rolling their eyes at everything the hopelessly square grownups have to say and do. More to my shame, the distance didn't stop with high school graduation. I continued to grow away from my father. I think some of it was a delayed adolescence: I didn't feel fully an adult until I was well into my 20s, and I never really rebelled. But Dad could tell something had changed, and it bothered him. He wrote to me several times in the 1980s, grieving this distance he sensed, blaming his own parenting for it, particularly something that happened when I was just a toddler and he, a brand new parent at 36, lost his temper over a toilet training incident. Of course, it had nothing to do with that. It was just me creating the distance I needed to truly leave home and be my own person. I understand this now, but neither Dad nor I did while it was happening. As the years passed, Dad and I tried on many occasions to bridge the gap. We could have bonded over professions, over music, over theology; mostly we had shared experiences that never really gelled into deep sharing. It didn't help that the major stroke of New Year's Day, 1995, was laid at the feet of my first divorce. Realizing I was being blamed, knowing that the family had no patience for my own suffering, I found other means of solace in Estacada, the community where I was living and working. I made friends, and they cared for me. I began to think I might not need my parents after all. But then I had to leave Estacada, to take up an appointment in Amity, just a few miles from McMinnville, and suddenly I was seeing my parents several times a week. They came to church in Amity, hosted me and my children for every special occasion, giving them and me a home when my own was so empty of joy and warmth. When I remarried, my second wife and her child were welcomed into their home, and I came to appreciate just how generous and open-minded they were toward the families of their sons. When that second marriage ended and, soon after it, my ministry career collapsed, they were gentle, compassionate, understanding in ways they had not been five years earlier. Perhaps they had lacked the capacity. More likely they'd grown. For all the love my father offered me, I still felt distance. Once he had his accident, breaking his hip in 2006, the distance began to grow. I felt him resisting the limitations his health and age were placing on him, wanting to keep driving, keep tinkering, keep active in his community. I could sense his frustration with his body; and yet I wanted him to let go of these things, to give up his independence, and it bothered me that he was so stubborn about them. Finally it became apparent even to him that his driving days were over, not because his always marginal driving was clearly getting worse, but because he couldn't get his aching body into the driver's seat anymore. Was this so bad? Of course not. It's a transition every elderly person has to make, and my father was hardly an exception in resisting it longer than he should have. And really, when the time came to give up his keys and sell the car, he took it with better humor than I probably will when it's my turn. That is when he truly became housebound, though. It's also when I found myself running out of things to say to him. I don't know if I really talked with my father at all in the last three or four years. I always embraced him when I visited, kissed his raspy cheek, told him I loved him to which he always hoarsely replied, "Love you too, son." Within me, I felt an aching need to tell him so much more: to thank him for all I knew he had done for me, to let him know that any distance that was between us was all my fault and not his, to let him know that, distance or not, I was proud to be his son. That's what I wanted to say. But I never did. I last saw my father at our family Christmas celebration December 28. The whole clan was around him, all his sons and their partners, most of his grandchildren. He was insistent that we sing "The Twelve Days of Christmas," and several times before it happened, he pulled on my sleeve, offering suggestions on how it should be sun. Every time, I assured him it would be fine, that we could do this. Finally we sang the song, holding up the signs he had made decades earlier when we were all small. In the video, you can see him singing along as best he can with his stroke-ravaged voice. He's having the time of his life. Once we finished, he quickly slipped back into the mild delirium he'd been experiencing for weeks, and soon asked to be taken to his bed for his nap. He was still in bed when my family left. I stepped into his room briefly to retrieve my coat, saw that he was asleep, quietly closed the door, and never saw him alive again. He died the next morning. Driving to McMinnville the next day and seeing his body, first as he lay in his bed, later at the funeral home, I was overcome with guilt. Tears running down my face, I leaned over him, put a hand on his forehead, and whispered "I'm sorry, Dad. I'm so sorry." Writing this, I'm feeling it all over again. As many times as I told him I love him, I never acted to close the distance I had felt for decades. My brothers assured me it was all right, that what Dad most wanted from his family was to be surrounded by them at that party, to hear them sing, to see how happy we all were with our families. And we were: most of us have been through hard times in the last decade, but all of us are now in places of strength and security. I've never felt more fully myself, and I have never been happier. This is the confirmation Dad needed before he could let go of his lifelong concern for his children's well-being. Now he can rest from his labors, and his good works can follow him. Even so, I wish I'd had that talk with him while he was still able to hear it, and know that, whatever distance there might have seemed to be between us, he will always be my father, and I will always love him.